The Users & Groups page is the interface for managing users, groups, and permissions in your GoFormz account. To open this page, click your username in the top right corner to expand the account management dropdown, then select Users & Groups from the dropdown. Groups are listed on the left, while users are on the right. When you first navigate to the page, you will see the home view, which displays all users in your account and all top-level groups. If you are accustomed to file systems, it may be useful to think of this as the root group that contains all users and all other groups, and has no permissions. In the example below, our home view shows 5 top-level groups: “Administrators”, “AIPAC”, “Eastern Region”, “Midwest Region”, and “Western Region”. To view one of the top-level groups listed on the home screen, simply click the group name. The page will change to show that group: the group’s subgroups will be listed on the left, and all of its users on the right. From here, you can click on one of the subgroups to navigate to that group, etc. Use the breadcrumbs at the top to keep track of where you are in the group hierarchy, and to navigate back to a parent group when needed. In the example above, the breadcrumbs at the top tell us that we are looking at the “New York” group, which is a subgroup of “Eastern Region”. The group has two subgroups (“NY North” and “NY South”) and 3 users. You can click on “Eastern Region” to view that group, going up one level in the hierarchy. 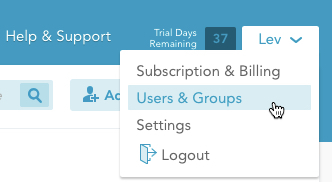 To see a list of all users and top-level groups, simply click the the house icon to return to the home view. To add a new user, click the Add User button in the top right. To add a new group, click the Add Group button in the top right. This will create a group that is a subgroup of the group that you are currently in. To search for a user or group, type your search term into the text box at the top, then click magnifying glass to display a dialog box containing the users and groups that contain your search term. The search results will be hyperlinked, allowing you to navigate to any of those users/groups. To edit or view a group’s settings, navigate to your group and click the Group Settings link in the top right. Note that the Administrators group does not have this button, because you cannot change its settings — it will always have full permissions. To edit or view a user’s settings, just click the user’s email address in the user list. To deactivate/disable a user, click the slider in their Enabled column. Be careful when doing this, as you cannot reactivate a user without involving GoFormz Support!